We were in Mexico the first week of June when I first noticed June's first toothy starting to poke through. 11 months! And she finally got an old toother. Turns out when it rains it pours because within the next month June had four teeth coming through at once. FOUR! Poor girl was miserable. Our very pleasant baby was suddenly fussy to the max and we were all struggling with the new adjustment. Nights were the worst- June could not fall asleep and had trouble staying asleep. We figured out a few tricks to help our little girl and since then we have all been much happier. Here's our best tricks- from me to you! 2. COLD WASHCLOTH A baby can't eat popsicles all day and all night, but another cold help that we love is a cold washcloth. Get a washcloth wet, put it in a plastic bag and freeze it. June loves holding on to her washcloth (It's almost like it's a little blanky for her) and just chomping down on it. It's seriously adorable. The fabric of the washcloth massages her little gums while the cold relieves the pain. 3. GUM MASSAGE When June is really feeling the pain from teething (at its worse she refuses to nurse and refuses a bottle; it is heartbreaking) I like to give her a little gum massages. Surprisingly, she doesn't protest at all. I use my pinky finger and just apply a little bit of pressure to her gums. She loves it. 4. TEETHING RING This one hasn't actually worked for us, but I'm including it on the list because I know a lot of babies love them. June doesn't quite have the attention to chew on something for long periods of time unless it is food. But I've seen plenty of other babies relieve their teething pain with the pressure of a soft teething toy. Maybe our next baby will be into this. 6. MAKE SLEEP AS ALLURING AS POSSIBLE When June is really struggling to fall asleep we try to do everything possible to make sleep somewhere she wants to be. We do a warm bath, put on clean, warm jammies, read her favorite books, hug dolly, and put her down. Although it doesn't take away the pain of teething, it does give June a sense of comfort, peace and security that I believe helps her to fall asleep and stay asleep. If we put her down in a rush she is much more likely to be agitated by her teeth. 7. INFANTS' ADVIL The nights when June is truly miserable, Infants' Advil has been our life saver. (Make sure you get the infant variety and not the children's variety- infant is for 6 months to 23 months, children's is for 2-12 years). The medicine is yummy (ours is grape flavored, June slurps it down) and is just enough to get her peacefully asleep for the night. This has been our best friend this summer. 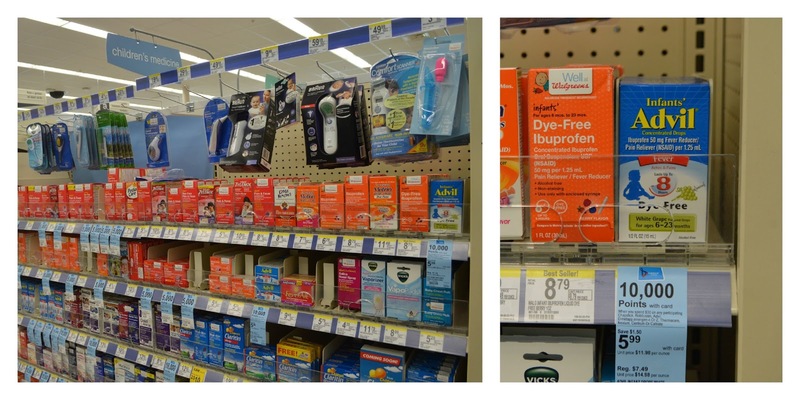 You can find Infant's Advil at your local Walgreens by the children's medicine. And right now you can get $1.50 off when you use the coupon found here. Infants' Advil® is available for infants ages 6 to 23 months old in a non- staining, Dye-Free White Grape liquid. Infants' Advil® Concentrated Drops are alcohol-free and come equipped with a syringe for easy dosing. Infants' Advil® contains ibuprofen, the medicine pediatricians use most for their own kids' fevers. Infants' Advil Offers parents a simple, effective solution to relieve their babies' pain with up to 8- hours of relief in just one dose. Any teething tricks I missed? With only four of her teeth through, I am sure we have many teething woes in our future. I'd love to hear your tips to making teething a little less miserable. I got a watch and it's made of wood! When Can I Have Another Baby?